Earthenware bowl with a tin glaze, and a maiolica inner glaze painting of a green fruit and light-blue flower bud. Red earthenware, thrown, tin glaze, maiolica (in-glaze) painting, fired to 1100 deg. 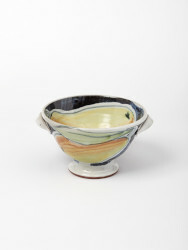 C.
Footed Bowl, Daphne Carnegy, 1991. Crafts Council Collection: P404a. 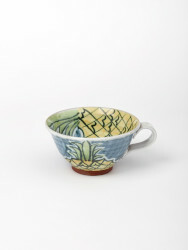 Photo: Stokes Photo Ltd.
Footed Bowls, Cup and Saucer, Daphne Carnegy, 1991. Crafts Council Collection: P404a. Photo: Stokes Photo Ltd.